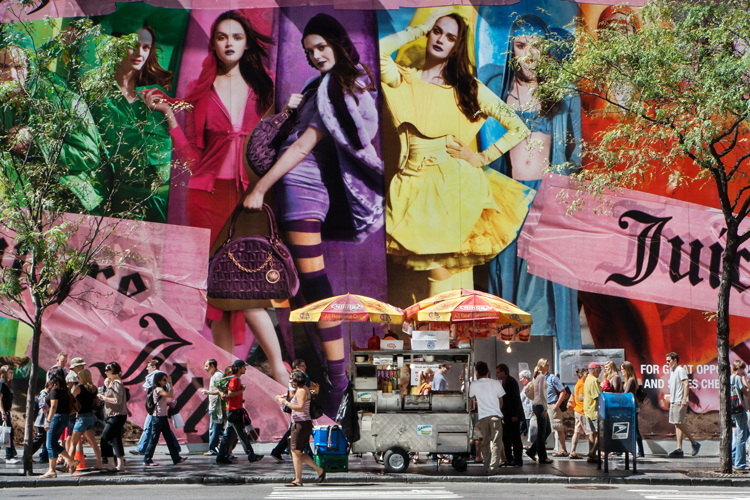 Juicy Couture 01, from the series "Coming Soon"
The effectiveness of outdoor billboards is juxtaposed with their impermanence; most are replaced after several weeks. The ephemeral nature, massive size and saturated colors of the ads create a fluid cinematic experience for the observer. People inhabiting the space underneath are pulled, unaware, into a staged set, the reality of the street merging with the commercial fantasy of the advertisements. "Coming Soon" is an exploration of our visual relationship with the branded city centers and the commercial environment we live in. There is an opening reception for Coming Soon at Anastasia Photo, Lower East Side, New York City tonight from 6:30-8:30pm.